The Best Quotes Of Martin Luther King Jr. Most people can name at least one Martin Luther King Jr. quote. However, a lot of the man’s best quotes do not get the kind of recognition that they deserve. Read on to learn more about his most important speeches and statements. After Martin Luther King Jr. was arrested for protesting in 1963, he spent time in a jail in Birmingham, Alabama. While he was there, he published an open letter that advocated for civil disobedience. Today, the letter is considered to be one of Martin Luther King Jr’s most important works. The letter contains many of his most famous quotes, including “Injustice anywhere is a threat to justice everywhere” and King’s criticisms of the white moderates that failed to support his cause. The letter also contains praise for the nonviolent protestors that were fighting for civil rights in Birmingham despite the risk of imprisonment. The best-known portion of the speech is the title; it’s rare to encounter a person in the United States that is unfamiliar with the “I have a dream” refrain. Today, this is considered to be one of the greatest speeches of all time. In 1964, King became the youngest man ever to win the Nobel Peace Prize. He was only 35 when the award was bestowed upon him. King chose to donate the entirety of his prize to the Civil Rights movement. During the speech, King acknowledged that the Civil Rights movement had still not attained the peace that they were fighting for. He described the movement as “beleaguered.” He also talked about the importance of avoiding violence and oppression when trying to fight against violence and oppression. Although Martin Luther King Jr.’s life was tragically cut short, his words had an incredible impact on the world today. His influence can still be felt in cities all across the United States, from Philadelphia, to Houston, to Oakland. Because of the speeches King made, many people were able to gain rights they did not have previously. When you look at his best quotes, you can see why he was such an important figure in the Civil Rights movement. 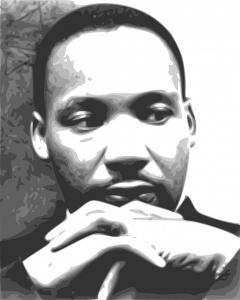 Comments Off on The Best Quotes Of Martin Luther King Jr.